A colectomy is a surgical procedure in which all or a portion of a person's colon, or large intestine, is removed by a surgeon. Typically, this type of surgery is used to treat patients with an intestinal blockage, unusual bleeding, cancer, irritable bowel disease or colon polyps, the Ohio State University Medical Center reports. Patients should discuss colectomy postsurgical complications with a medical professional before undergoing this procedure. After a surgeon removes a portion of the colon, she sutures the two loose ends of the colon together with stitches. If this newly created intestinal connection does not heal properly, patients can experience colon leakage as a postsurgical complication of colectomy, according to the University of Chicago Medical Center. Colon leakage causes ingested food products contained within the colon to leak into the abdominal cavity. Patients who develop this complication of surgery are at risk of developing a severe abdominal infection called peritonitis. Symptoms of this infection include increased abdominal pain or swelling, fever or upset stomach, and affected patients should receive immediately medical care. In the absence of appropriate treatment, peritonitis can lead to a life-threatening infection of the bloodstream called sepsis. Organ damage is a potential postsurgical complication of a colectomy. 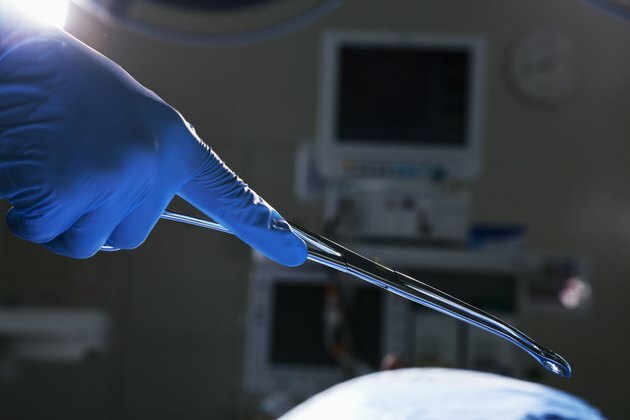 During surgery, a surgeon can accidentally damage organs proximal to the large intestine, such as the bladder or small intestines, MayoClinic.com explains. Damage to these organs during a colectomy can lead to bowel movement or urination problems after surgery. Typically, organ damage is detected by a surgeon during a colectomy, allowing him to immediately repair the site of injury. Patients may require additional surgery to repair organ damage that isn't detected until after a colectomy. Surgical procedures, such as colectomy, increase a patient's risk of developing postsurgical blood clot complications. A blood clot is a sticky mass of blood that typically adheres to the inside of a deep vein in the legs, Kaiser Permanente warns. This mass can interfere with the normal flow of blood to the legs, leading to symptoms of leg pain, swelling or discoloration. In certain causes, a leg vein blood clot can detach and flow along the bloodstream into a patient's lungs. This life-threatening complication is called a pulmonary embolism and requires emergency medical attention. Patients who undergo a colectomy can develop postsurgical bleeding or infection complications. Excessive bleeding may require patients to receive a blood transfusion to restore normal blood levels in the body. An infection can cause increased abdominal pain, watery diarrhea or fever and antibiotic medication is generally necessary to resolve infection complications.